Just the other day we told you about Yahoo's new WakingNews Alarm Clock app that wakes you up with the sound of the morning's headlines. You can pick from a variety of sources, and there are also traditional sounds to choose from just in case news headlines are too jarring. Now, Google has integrated its Google Assistant Routine into its Clock app. This allows you to have Google Assistant turn on or off smart appliances like certain lights, and adjust the thermostat once you dismiss the alarm. In addition, once the alarm clock is dismissed, you can arrange to hear the weather outside, the traffic along your daily commute, and a variety of news headlines. You can choose a CNN News briefing, the latest business headlines from CNBC, the latest sports news from ESPN and more. 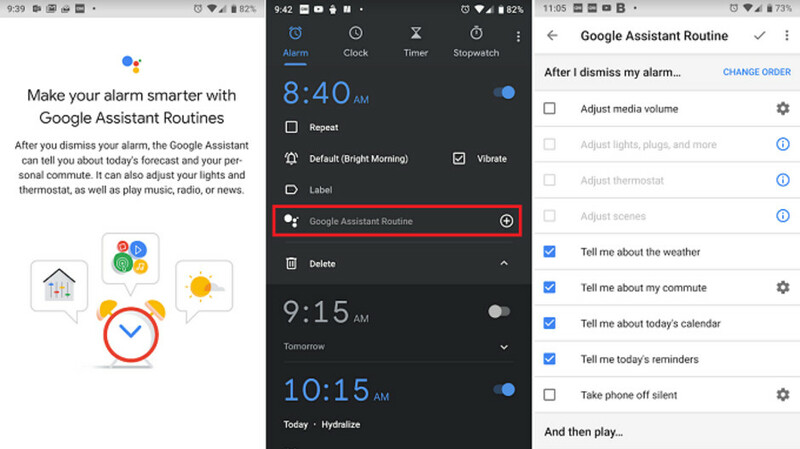 All you need to do when you set an alarm is to click on the new Google Assistant Routine option on the Google Clock app's Alarm Clock setting (see image at the top of this article), and set your routine. Once you select a certain topic, like "news," click on the settings gear to see what options are available (check out the image at the bottom of this article). Keep in mind that this feature is available only from the Google Clock app, pre-installed on many Android models and also available for free from the Google Play Store. While Yahoo's app can wake you to the sound of news, Google's new feature makes sure that your usual alarm tone has you up first before informing you about what is going on in the world.